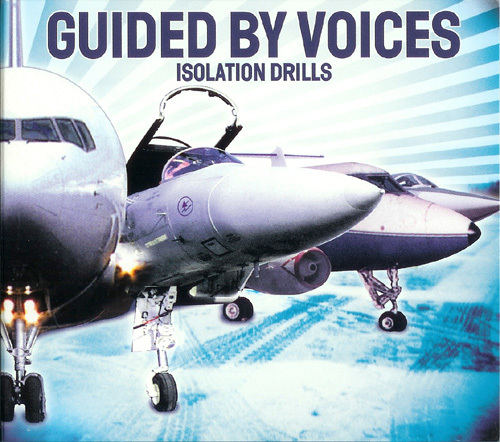 Following Guided by Voices first attempt to push the mainstream with their first TVT Records LP, Do The Collapse, they tried again for the mainstream push with their follow-up TVT Records release. This time, the GBV boys chose to forgo the Ric-Ocasek-as-producer path, and instead went with Bong Load Custom Records founder and producer Rob Schnapf. Schnapf had previously received acclaim for producing '90s recordings such as Beck's "Loser," and later went on to produce such artists as 00's drool darlings The Vines, and Saves the Day, as well as the later Elliott Smith. Isolation Drills, unlike its polished predecessor, is soaked through with several more fan favorite tracks ("Chasing Heather Crazy," "Glad Girls," "Run Wild," "Fair Touching," etc.) Gone are the new-wave synth intrusions of the previous LP, but Isolation Drills employs plenty of lush orchestration in it's own right. Crisp production, and terrible album art is also all but gone with this release. However, the terrible album art is the only obstacle for one listening to this record. As a whole, the LP is a gorgeous, pop push from Pollard (at this point in his 40's) to a new attempt at household status. Sadly, the LP again failed to draw in the masses, but remains an absolutely solid 16 track affair. Also, adding to the folklore, the aforementioned Elliott Smith dropped by to add keys to 3 of the songs on the LP. Fair Touching- 5 A rerecorded version of what originally appeared on the Lexo & the Leapers EP, Ask Them. Mid-tempo jewel with gloriously great hooks. Goes down as easy as ice cream (unless your lactose intolerant, or hate great pop songs). This song is also graced with a fantastic bass line. Skills Like This- 4 Rocking, Gillard-riffage soaked, grand pop. Song’s got some attitude, but with airy, slick Pollard vocal melodies. Chasing Heather Crazy- 5 One of the absolute best late period GBV song. An unmistakable guitar jangle opens the track, as great verses follow and lead into over-blown pop choruses. Hey, it’s summer everywhere when this song plays, so go have a BBQ or something. Frostman- 4 GBV got a little nostalgic for the lo-fi days would be a probable conclusion upon hearing this number. Haunting, short, and ruminative. Later re-recorded for the Pollard solo 7’’ Miles Under My Skin for some nonsensical reason. Twilight Campfighter- 4 Melancholy yet upbeat. Incredibly sad, yet bright slow burner. May not bowl one over immediately, but is great a perfect example of highly produced wistful pop done well. Sister I Need Wine- 3 Acoustic guitar, string swells, and hushed vocals. Darkly haunting. Want One?- 2 Some of the silly proggy rock, with annoying “want one” vocal parts thrown in. Indicative of what would later clog up Pollard solo LPs. It’s unfortunate that this track ruins a good run of songs. Do enjoy that whistling part, though. The Enemy- 5 Starts with lo-fi basement recording that’s tacked on to the grandest, simplest, downright excellent guitar riff, maybe ever. Proggy for sure, but one hell of a band performance. HUGE, and long, but so damn good and worth your time. Unspirited- 3 Lush, grandiose track that’s mildly catchy, pretty, and slightly over-blown on the schmaltz meter. Oozes some syrup out of the control console. One too many violin tracks? Glad Girls- 4 One of the singles and fan favorites off the LP. Often a fan favorite, this gets to me sometimes for having such sappy, big verses. However, the quality of the choruses on this song distract me and I remember why I'm in love with this song. A personal conflict of skipping or listening every time it comes up on the LP. Run Wild- 3 Arena-rock with a grimy riff explodes into open-aired choruses with Pollard bellowing hopeful melodies. Lyrics are pretty lame all around. The track always feels like it could be something more, something better, but remains rather ho-hum. Pivotal Film- 2 Slow, rhythmic and heavy rocking plodder of a song. Big production on such a stoner tempo song doesn't quite make sense. Not much to write home or on this blog about. Frankly, it’s boring. How’s My Drinking?- 4 Sorrowful, waltzy, dizzying song. Would have loved to have heard a lo-fi version of this to close out an LP. Here the vocals are a bit loud and wobbly. But what a sad, great song, despite such mismatched production. The Brides Have Hit Glass- 4 Jangled, airy pop. Mid-tempo easily listening with some uplifting pop. Okay, retired dad’s might dig this song, but so do I. Can’t wait to retire. Fine To See You- 4 Famous for the fact that Elliott Smith played piano on the track. Hauntingly cold, pensive track, as is probably expected. Pour yourself a steamy cup a coffee and reminisce out a frosty window somewhere. Gorgeous and near perfection. Privately- 2 Lush, reflective closer that’s bewildering in length. As well as being a time consuming track, it is unfortunately fairly boring. Song sort of plods along through string flourishes and off-timey group accents. I don't care for "Chasing Heather Crazy" or "Glad Girls," too faceless for me. "Brides have hit glass" is one of the best songs about divorce ever. Never been a huge fan of Glad Girls, though I enjoy it plenty. Chasing Heather Crazy's sublime, cascading, joyous melodies however cannot be denied. Goes well beyond the realm of being faceless. some of Pollards best vocal arrangements on this album, just listen to Twilight Campfire. I also always loved Sister I need wine..Classic album!